Buyers snapped up 34,662,500 Silver Eagle bullion coins in 2010, capping the best sales year ever for the series which was introduced in October 1986 as a means to purchase silver inexpensively. The weakest month in 2010 for Silver Eagle bullion sales turned out to be December at 1.772 million, representing a drop of 36 percent from the same period last year. Ironically, November was the biggest month. Three records were hit. They included the best ever monthly sales along with two yearly levels — the previous annual sales and prior year-dated Silver Eagle mintage records were toppled during November. Despite December having the lowest monthly sales total in 2010 for Silver Eagles, it was not the worst month of the year in terms of total ounces leaving Mint doors. The US Mint also sold 825,000 ounces of the new America the Beautiful Silver Bullion Coins. Add those into the mix and the final month of the year climbs a few spots, making December the seventh best month in 2010 for silver bullion sales. Perhaps most interesting, the US Mint sold 241,277,000 of the bullion Silver Eagles between 1986 and 2010. 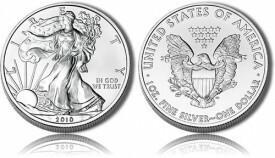 The US Mint began accepting orders for bullion 2011 Silver Eagles on January 3, 2011. However, the Mint also has remaining inventory of the 2010-dated eagles which it is requiring its authorized dealers to order with any new 2011 purchases. As such, the final mintage level for the 2010 Silver Eagle has not been announced. The bullion eagles should not be confused with the numismatic proof versions, which not only have the special finish collectors seek, but bear the "W" mintmark denoting their production at West Point. Also, numismatic proof eagles are sold directly by the US Mint to the public. Bullion American Eagle coins are not. The US Mint uses 11 Authorized Purchasers who buy bullion coins in bulk and then resell them to coin dealers, precious metals suppliers and other companies who offer them in smaller quantities.